Weatherproof IP54-rated housing is suitable for harsh environments. These units can be series for input to a datalogger, recorder or plc. Simple and reliable blind transmitters are ideal for connecting to your PLC for advanced control systems. Or connect to a recorder for a low cost documentation system. 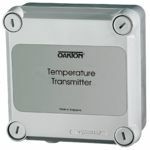 Transmitters can be installed in series with each transmitter isolated from the other to prevent disruption of operations even if one transmitter fails. These economical transmitters can be installed at multiple sites within a plant.